A group of students from the University of Plymouth will be combining their engineering expertise with raising environmental awareness after being selected to participate in a major international event. 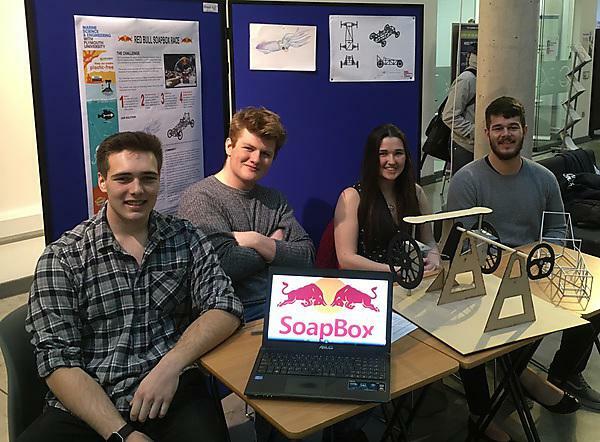 The four Stage 1 engineering students – under the team name The Dramatic Aquatic – will be joining around 70 other teams on the start line of the 2017 Red Bull Soapbox Race in London on Saturday 9 July. They are now putting the finishing touches to their design in the hope of producing a vehicle that will speed down the 420m track at Alexandra Palace, and survive intact. They are also starting to create an eye-catching exterior shell that will raise awareness of the problem of marine litter, a subject in which the University is leading the way in terms of research and awareness-raising. And they are developing a 20-second crowd-pleasing performance, which they will have to act out before pushing their soapbox into action. The team comprises students Harrison Drayton, Izaak Frost, Campbell Thomson and Jessie-May Turner, who started working together during their Plymouth Plus module. The frame of the soapbox will be constructed in the engineering workshops at the University, providing a strong and rigid frame which should survive the course’s many obstacles. The exterior will then be made out of plastics which the students plan to collect through beach cleans, all formed together in the shape of a squid. The students are currently combining work on the project with finishing their Stage 1 exams, but are confident of having everything complete before the race in July.